Digital Surrogates from the Biological Computer Laboratory Publications include grant proposals, technical reports, publications, general reports, and yearly summaries concerning cybernetics, biological computing, sound processing, self-organizing systems, visual processing, language processing, computational semantics, complex computer systems, computers and cognitive functions, computational linguistics, and information processing. 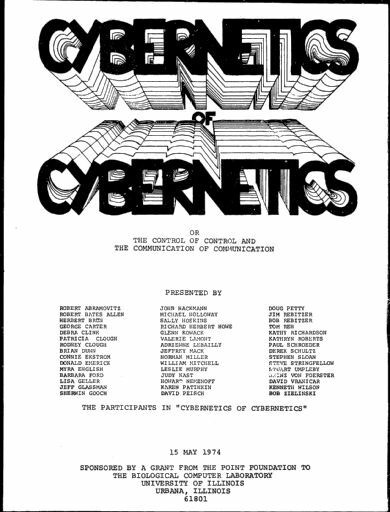 Authors include Heinz von Foerster, Murray L. Babcock, W. Ross Ashby, Gotthard Gunther, Albert A. Mullin, Paul E. Weston, Gordon Pask, John Russell, Humberto R. Maturana, Lars Lofgren, Alfred Inselberg, Dan Cohen, Alex M. Andrew, Francisco Varela, and more. The Biological Computer Laboratory Publications (Digital Surrogates) are managed by the University of Illinois Archives and do not feature precise descriptive information for each item. Discover their contents by browsing the folders and files. For more information, contact an archivist at illiarch@illinois.edu.